Apartment Busoler is situated in Southern Istria, near to one of the most popular, 3000 years old Roman town Pula. It's also near (5km) local beaches, hotels, airport and Marina Veruda - sport harbor. The location is just 100 km from Italy and mere 10 km from the Brijuni islands, the National park with outstanding natural beauty. Moderate climate in winter and springtime makes numerous choices for athletic and sport activities. On the other hand, summer is the time when Istria swarms with people from all over the world. Although crowded, our town and its countryside provide a quiet and carefree rest. Sunny days, memorable sunsets, quietness and order combined with many different events and happenings offer you the most desirable place to go on a vacation. 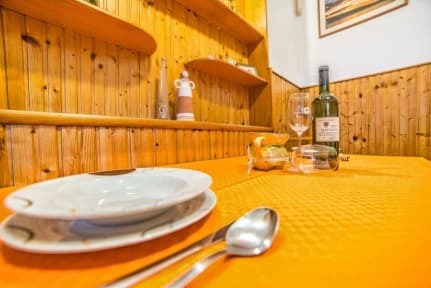 The apartment is completely furnished and equipped for 2 or 3 person. It consists of a bedroom with TV, separated bathroom, kitchen with all necessary equipment and a balcony. There is a safe parking in front of the house. Towels and linen are included, as is the final cleaning. There is a central heating system for wintertime and air-conditioning system. A baby bed is available on demand. Absolutely a friendly landlord and execeptional kind. She Welcomes the guest by offering free wine. Because of taxi scam we were shortage of money to pay the rent, after all , she said it is okay. Still we owe her few €€€. Definitely will not forget her kindness and generosity. Thinking to pay the rent in terms of a gift to her once we back home. Excellent place to spend holidays in quiet, calm and safe atmosphere. The apartment even has a small, green terrace which allows you to enjoy your meals outdoors and still keep your privacy. All the best! Lovely apartment with everything you need. The owner was very generous and friendly, even giving us a bottle of local wine to try. Great little apartment has every thing you need you can cook your own food wash your own cllothes this place is set up to stay as long as you like. The owner is great she even put a bottle of wine in the fridge for us. Was very pleased with this apartment. Hospitality was great and made me feel at ease as I was on my own. Was run by a family and felt very welcome and to top it off I was made pancakes in the morning! Good location if you want to be close to the airport. The apartment was perfect for our overnight stay near Pula with good shower and comfortable bed. It has a small terrace, and kitchen/dining area. We found our way into Pula without much difficulty and had a nice swim at a nice rocky point near Verudela. 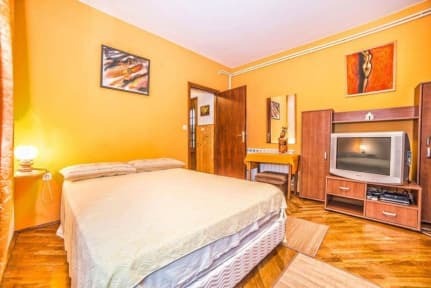 There did not seem to be restaurants etc in location of apartment but it is not far from a major road around Pula, and a large shopping centre and supermarket is easy to access off a roundabout there. Parking in the street was possible. Overal a nice stay, very friendly host. It does not really look like a hostel this made it a bit hard to find. Overal a nice night!